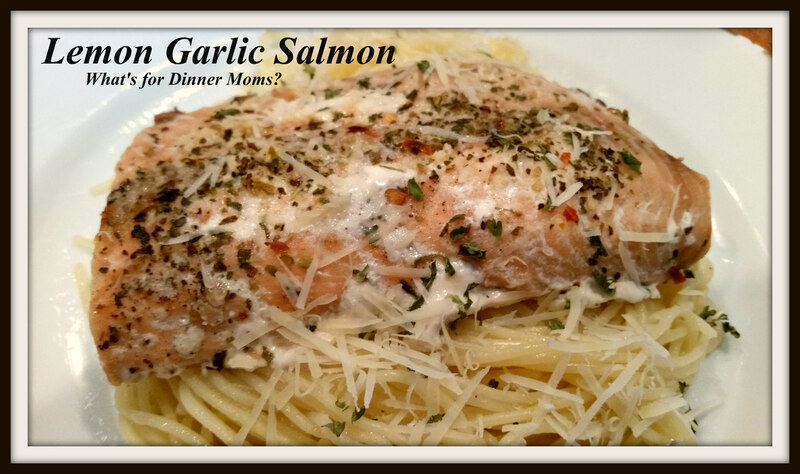 Lemon Garlic Salmon and Walking Again – What's for Dinner Moms? As I started this year I pledged to myself to try to present the truest picture possible about our life. Everyone has struggles and things to get through and as we read these blogs sometimes we forget that we are reading about real people and their lives. Sometimes things look so fairy tale like that it seems that we can never live up to the life they are presenting for us. Sometimes we do that by omission or fear or we just don’t want to talk about what we really are dealing with. Last August I awoke one morning and couldn’t take a step with my right foot. I had this happen about 3 years ago and it was a torn LCL and it took about 6-8 weeks of resting before it even began to heal. I knew what I was in for. So, I started resting it, icing when necessary and lots of Tylenol. It is difficult to rest your leg. Think of how many times a day you take a step. I had to walk on it as little as possible. Around October it was finally starting to get better, I no longer needed a cane to walk but it was still painful. I was getting in our second car which is low to the ground and I NEVER drive because I don’t like it, and I felt my knee wrench. It made me scream in pain. I knew immediately I just set myself back another 6-8 weeks! Again, I started resting it and sitting very still. No grocery shopping, no walking in the store, no life really. I could drive but getting into and out of the car were difficult too. I held out until December, 4 months after this all began. By then my hip was now hurting too because I limped so badly during the little I did walk during the day. My children helped me dress my feet because I couldn’t bend to pull on socks or shoes. If I dropped something I had to find someone to pick it up for me. I directed my children in how to make dinner, do laundry and carry the clothes to me and put them up so I could reach them just to fold them. I finally could not take it anymore and went to see the doctor. She ordered an x-ray thinking it was just the LCL again and I would need some physical therapy this time to help it along. The next day she called and it was severe arthritis with extensive bone growth and my knee caps had now drifted to the outside of my knees because of how I was walking and the muscles were too weak in some places and too strong in others. Physical therapy to hold off full knee replacements as long as possible was the answer. I started physical therapy the end of January. By then the hip pain was so bad I would cry every morning walking down the stairs. I would get to the couch and not move all day it hurt so much that tears would come if I just stood up. I pretty much had given up that I would ever walk normally again or participate full in my life. I could not see through the pain. It wears you down mentally and physically. I was tired and depressed all the time. But, physical therapy has helped so much. The hip pain was not because of how I was walking but after another x-ray was done, a few weeks ago, we found out it is severe arthritis in my lower back. Slowly the pain in my hip has moved to my back, which they keep telling me is a good thing. (I am not fully convinced of that yet.) I have started being able to walk short distances and going into grocery stores. I can’t do a full shop yet but at least I can run in and get the 1 or 2 things I need for the day. I didn’t realize how freeing it is to just do these simple things again. I am not fully back but I can go up a 3″ step and down several times in a row during therapy. I am working toward a full set of stairs. That is my main goal, one flight without railings. I will get there. Some days are easier than others but I can feel myself getting stronger again. I don’t need someone to stand next to me when I get out of a chair so I don’t fall over, I can go downstairs in the morning and not wake my daughter with my sobbing because the pain is so bad. It is better, I can see the other side, the veil of pain is lifting. So, that is real life right now. I go to PT twice a week and will for the foreseeable future. Sometimes I get home and can barely move for a while, especially on cold or rainy days, but there are fewer and fewer of those days. Now, it mostly feels good and I feel like I am really getting strong again and truly accomplishing something. I have goals set and my mood is improving. You forget that simple things like running out to the store to get milk can really be joyful on a bright sunny day when you haven’t been able to do it so long. I have not shared really with anyone how bad my knees, back and pain were. I didn’t want to appear weak or helpless because that is the opposite of how I see myself but sometimes we are all weak in some form and need help whether we want to admit it or not. So, this recipe came about because of my daughter. I sent her looking in the basement freezer for something for dinner and she came back with a pound of frozen salmon. There were only 3 of us for dinner so it was perfect. I like salmon but it is not usually my first choice. I need it to have tons of flavor and not taste too “fishy,” I was worried because this was Pink Salmon which can be fishy and watery when cooked. The minute I opened the packages I could smell the fish but I kept working on it. The bright smell of the lemons matched my mood so it made me smile as we cooked! This was yummy! The spices and lemon cut any fishy taste and we made extra sauce to serve over the pasta with a dash of red pepper, black pepper and some freshly grated Parmesan. Both kids ate 1 1/2 pieces of salmon and 2 servings of the pasta. It was a definite hit. The best part was that it was easy to make the dish gluten-free for my mostly gluten-free son. The salmon was gluten-free (double-check those spices, especially if you are cooking for someone with Celiac) and using gluten-free pasta for his servings. I served this with broccoli on the side. Preheat oven to 375 degrees. Lay the salmon on a large sheet of aluminum foil that you can fold into a packet around the fish. In saucepan place the lemon juice. Bring it to a slow boil and allow it to reduce by 1/2. It will take 10 minutes or so. Remove the lemon juice from the heat and add in the garlic and butter. Stir until the butter has fully melted. Spoon 3-4 tablespoons of the lemon mixture over the salmon. The sprinkle the spices over the tops of the fish. Fold the aluminum foil over the fish and bake for 10-12 minutes until just about done. The amount of time needed to cook could be more or less depending on the thickness of your salmon. Remove fish from oven and open foil packet. Turn oven to broil and place fish under broiler for 1-2 minutes to brown the top if you wish. Serve over angel hair pasta with extra lemon sauce, red pepper flakes, salt, pepper and Parmesan if desired. Thank you! It is so much better than where I was and can only see it getting better and better! I, too, am walking around with an ace on my knee–sprained while walking down stairs. This is after crashing into a wall and opening up my head, necessitating 5 stitches, a wrenched neck and a few months of pain. Sheesh…! Cooking is wonderful therapy. I prep. Sit. Assemble. Sit. Cook. Sit. That’s the only way to accomplish while in recovery. My best wishes to you. And keep cooking! Thank you! Your message came as I walked out of physical therapy. Today is a sunny day and everything seems possible! This recipe looks so yummy to me. I don’t do pasta much these days, but I love brocolli and salmon. I will have to try it. I’m not real big on lemons with fish, but I do love the dry rub my SIL shared with me. Soooo good! Gotta get me some fish, soon! I’m sorry to hear about your back and leg/hip pain. I struggle with chronic pain, too, so I understand. PT did wonders for me, and now I’m thinking maybe some Chiro work needs to be done. I hope you are operating in the pink soon! Until then, hugs!! Thank you so very much for your kind words. Disney was a HUGE struggle last time we were there but I thought it was because I wasn’t in shape not because of my knees. I have a goal of July being able to walk it, albeit slowly as long as weather and all the planets align. 😉 The nice thing is we are going without kids so we can go very slowly at my pace, not tgeirs. Sorry to hear, wishing you the very best! Looks delicious. Sorry about your health issues, hope the PT will be of great help! Thank you. It is! I am amazed at what they can get me to do! Marci, my word you must be going through so much pain. My hubby suffers from Arthritis in his wrist and mainly his one knee, He will have to have a knee replacement, but is putting it off for as long as possible. In the meanwhile he takes a vitamin called Arthro Guard and a vitamin 3,6 &9 everyday, supposedly to help. Your condition sounds a lot worse, but knowing what he goes through I really feel for you and your pain. I hope with the warmer weather approaching your way, it will ease some of that pain. Take care. Thank you for the information! The weather definitely is helping as is the PT. I can feel myself getting stronger again which makes me happy. There will be bad days but I feel I am on the upswing again. Like all the other who have written, I too am sorry to hear about your health problems. That said, I’m am delighted you shared what’s happening in your life with all of us…it makes the rest of us bloggers/writers “think”. About once a year, I take stock of how my life appears over at inanirishhome.com. Sometimes it looks pretty amazing…but the fact is we too have our concerns and worries and frustrations. I’ve been trying to inch myself closer to writing more openly about our life, warts and all, but it’s not easy! Hang in there, keep looking after yourself and, again, many thanks for your openness. Thank you for your kind words. Warts and all are real life. I am trying to remember that people need to read not just the good stuff but the stuff that leads us to who we really are and why we do and think the way we do. It will eventually lead to a greater understanding of our writing and point of view. I keep having to remind myself of that one! I’m so sorry to hear about your troubles and pain!!! No fun for sure! I hope the PT helps allot dear! Always a great recipe. Thanks for sharing your life with us! Thank you so much! I love PT! Most days I feel soooo much better. It’s amazing how much you don’t realize what you can do until it’s all gone. So sorry to hear about your pain. Physical therapy does help. It takes time and it can be hard to see yourself as independent and thriving during the wait. My prayers will be for your healing. Cooking and blogging are great therapies! Get better soon. I’m really happy you are getting better!! I am so sorry to hear you’ve been suffering. I hope your life keeps improving. Thank you so very much. It is definitely is looking up! Well shoot, sorry about all the pain, but it appears you are improving and look at what great meals you get on the table for the fam! Thank you so very much, Lana. It gets better every day. So sorry to learn about your excruciating pain. That can’t be easy at all. I am glad you are taking it easy and maintaining a positive frame of mind. Anyone who portrays their lives as fairytale must be fooling themselves. There are no perfect people nor perfect homes. Do take care of yourself and stay blessed. Thank you so very much. Each day it is getting better and better!